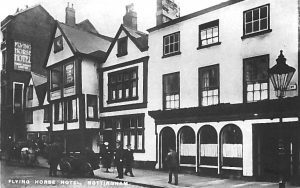 University of Nottingham > Blogs > Manuscripts and Special Collections > From the collections > Cheers to Nottinghamshire’s Pubs! It’s almost that time of year when people eat, drink and make merry. Public Houses, taverns and inns have been at the centre of English community life for hundreds of years. Their origin can be traced back to Roman Britain, when places to seek rest and refreshment were established along the network of Roman roads. These spread and grew to become a focal point for socialising, eating and entertainment. A survey in 1577 of drinking establishments in England and Wales for tax purposes recorded over 16,000 alehouses, inns, and taverns, or roughly one for every 187 people. This seems high, but official public business was often conducted in a town or village’s public house. As a well-known landmark, and a place capable of holding large gatherings, the pub would often host coroner’s inquests, military recruiting drives and property auctions. The ready availability of refreshments probably didn’t hurt, either. Picture postcards were first produced in the 1890s. Many pubs and other notable landmarks were photographed and no doubt most landlords were pleased to get the publicity. Now a shopping arcade, The Flying Horse Inn’s name reflects the tradition of inns providing accommodation and stabling for travellers. It was an inn from at least 1400 until 1989 (when it became a shopping arcade) which is an impressive history but it is by no means the oldest pub. Ye Olde Salutation Inn claims that it, not Ye Olde Trippe to Jerusalem, is the oldest pub in Nottingham. In the 1990s, the University’s Archaeology Department dated timber used in the construction of the pub to about 1360, but there was probably an earlier building on the site. During the Civil War (1642-1646), both Royalists and Parliamentarians used it to recruit soldiers. Nothing is known of Henry Daws whose name appears on the inside cover of the account book, which is dominated by payments for barley and malt. These were the two key grains used in the production of beer and ale, and it seems likely therefore that Daws was a distiller, maltster or brewer. 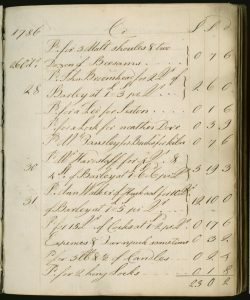 The cash book contains details of Daws’ expenditure as well as memoranda recording what he did on particular days, with little attempt to distinguish commercial payments from other expenditure, indicating he probably owned and operated his own business. This letter from Scottish politician, judge and noted bon vivant Duncan Forbes discusses the state of manufacturing and revenues in Britain. 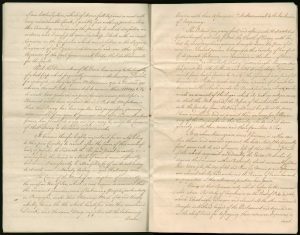 He made an unusual complaint: the ‘excessive use of tea, which is now become so common that the meanest families, even of labouring people …. make their morning’s meal of it, and thereby wholly disuse the ale’. An influx of cheap tea into Scotland resulted in ale consumption dropping, which had ‘gravely affected’ excise (i.e. tax revenue). Forbes’s plan to prevent the widespread use of tea does not appear to have been a long-term success: the UK is currently the fifth biggest consumer of tea in the world, and drinking ale at breakfast is frowned upon (even at Christmas). Alcohol-related offences are nothing new, despite what the media implies! 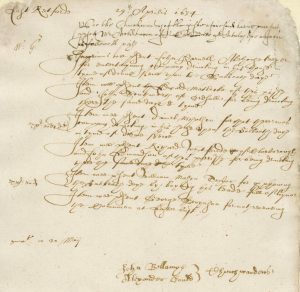 In 1634 John Parnell, alehouse keeper, was summoned to the Church Courts for entertaining company drinking in his house in time of divine service on the Sabbath day; Edward Matlocke of East Retford and John Sowthworth of Ordsall for drinking there the same day and time; Daniel Nicholson for having company drinking in his house on the Sabbath day in time of divine service; Richard Whitfeilde of Clarborough and John Edmundson of this parish for drinking there the same day and time; William Mason, tailor, for profaning the Sabbath day by ‘boiling his leade full of liquor’. The only non-alcohol related offender was George Swynson, who had not received communion at Easter. Trade directories were issued from the mid-18th century until the 1940s. 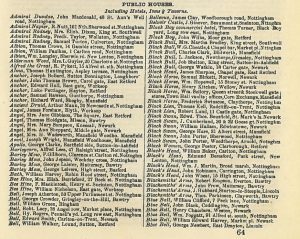 Businesses, tradesmen, public authorities, charities, and (depending on the type of directory) the wealthier private residents could have their names and addresses printed, for a fee, and therefore be more easily found by the public and potential customers. The list of public houses in Nottingham and their licensees takes up several pages. Trade directories also made money from selling advertising space. 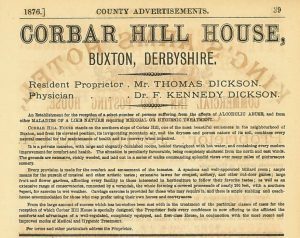 In the same directory as the list of public houses was this advert for a rural hospital in Derbyshire, where those suffering from ‘alcoholic abuse’ could seek treatment. As well as a resident doctor, inmates benefited from fresh air, ample opportunities for exercise and recreation, and elegantly-furnished rooms. Addiction issues were poorly understood and treatment was very much based on providing a safe, tranquil retreat where mind and body could be restored to health. All these records are available to view in the Reading Room at Kings Meadow Campus. You can also follow us on Twitter @mssUninott or subscribe to our newsletter Discover.